Some of the character traits in German Shepherd Dogs are purely genetic. Just like the components like pigments, anatomy etc. are engineered into the dog genetically, so are these traits. Well bred GSDs have all positive traits in common. This post on character traits in German Shepherd Dogs is going to talk about the purely genetic traits in the breed - starting from the physical endurance to agility, distractibility and a few more! Physical Endurance: Physical endurance describes the overall physique of the dog including sturdiness, muscular tone and general physical condition. This is a genetic trait and breeders must keep this in mind while breeding. A well bred dog usually has a good physical endurance. A dog with an excellent physical endurance spends less energy while working. This ensures both quantity and quality of work within a specified amount of time. Agility: Agility is another remarkable feature in German Shepherd Dog breed. Agility describes the total coordination of the dog, including its natural fastness. Reputed breeders keep the Agility trait in mind while breeding, so that the dogs natural tendency to pursue things with fastness and surefootedness is not spoiled. Sharpness: Alike these traits, Sharpness is transferred genetically! This is why not all German Shepherds are equally sharp. Degree of Sharpness is how intensely he reacts to a stressful situation. It is also a by-product of his intelligence. For instance, if your Shepherd bites you for no apparent reason, and if he is sharp enough, he will immediately realize his fault. This will make him cool down to his normal status. Feral Tendency: Feral tendency is a purely genetic trait, which is a tendency to revert to an animal in the wild. A well bred dog has a higher feral tendency and will act more intelligently than the other dogs. A dog with high degree of feral tendency can be more easily trained and acts more obediently during the period of stress and pain. Dogs with low feral tendency will mis-behave in stressful situation. Distractibility: Distractibility is environmentally influenced genetic trait that describes the tendency of the dog to get distracted from its allotted work. High degree of distractibility trait means the dog is highly influenced by the environmental factors, which is not a desirable trait as it hampers the working ability of the dog. Remember, GSD is a working breed. Most well bred dog are have amore or less high degree of distractibility, but that doesn’t mean that dog is genetically weak. Most well bred dogs have the ability to maintain the competency, but hidden. All you need is to carry on a rigorously typical training session to make use of the competency and attentiveness hidden within them. Dogfight Tendency: This is purely a genetic trait in German Shepherd Dog and other dog breeds also, but many canine behaviorists have defined it as a Genetic trait, based on environmental influences like distractibility. Most people seem to get confused with Dogfight trait, as this trait typically resembles closely with what we call “Fighting Drive”. Specialists have drawn a thin line to set Dogfight Trait apart from Fighting Drive. Dogfight trait is a genetic trait that describes a typical aggression towards other dogs, irrespective of breed, gender and age of the counterpart. I have seen dogs that are cool with strangers and even kids, but shows harsh aggression towards other dogs/ mongrels. The most important point of difference between the Fighting drive and Dogfight trait is that Fighting Drive mainly aims towards victory, where the looser, on showing submissive behavior, is released to escape. Dogs with the high degree of Dogfight trait aims at the victory, usually ending up with severe injury or even death in worst case. List of character traits in German Shepherd Dogs also includes Dogfight trait. Sensory Threshold: Sensory threshold is a purely genetic trait in German Shepherd Dogs. This trait describes the level of stimulus that a given amount agitation can make the dog to respond. The dog may whine, scream or bark in response to agitation. This describes the amount of stimulus that makes the respond to agitation. Dogs with higher sensory threshold take longer time to respond to agitation; they handle such situation more intelligently. They usually have stronger character with higher feral tendency. Dogs with lower sensory threshold gets agitated easily, which in turn means they have lower Feral tendency. Well, I have posted all the character traits in GSD in the three posts including this. The first two were respectively on Psychological + Physiological traits and psychological, but genetically based. Stay tuned… up next more interesting information about German Shepherd Dogs. Hello friends... hope you have liked post psychological and genetic character traits in German shepherd Dogs. 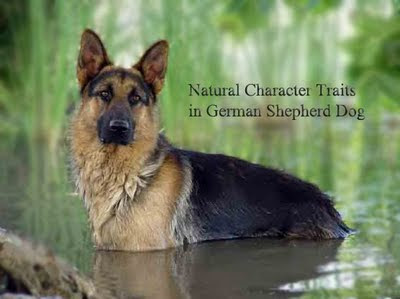 Check out the last post on NATURAL TRAITS IN GERMAN SHEPHERD DOG. As I said before, I intend to write about some other character traits in German Shepherd Dog breed that are psychological, but physiologically based. That means these traits are purely psychological. While identifying the character and personality traits in German Shepherd Dogs, you can clearly notice that these animals have high degree of self confidence, and shows typical behavior of aloofness at times, which will make a stranger think twice to make friends with them immediately. Alike some of the other dog breeds, the heavy-weight personality of German Shepherd Dogs blends well physique of the breed. Physiological traits in German Shepherd Dogs are the traits backed by the mechanical, physical, and biochemical functions in the dog. The character traits of any dog breed depend on many factors. German Shepherd Dogs are sometimes quite hard by nature (both mentally and physically) and pain tolerating capacity is high, while soft at some other times. Both hardness and softness in the characters are the psychological traits in GSD that are physiologically based. Hardness: Hardness is the trait that is both psychological and physiological. It is a mental resiliency (backed the physical and biochemical soundness) to not-so-pleasant experiences. Hardness is judged by putting the dog into situations where the pain threshold can be determined. Pain threshold is the point at which the dog starts reacting to pain. The intensity at which the stimulus (physical and mental pressure and stress) starts evoking pain the threshold stimulus. To be a bit more simple, the pain threshold is the point at which the starts not to tolerate the pain any longer. Since the threshold stimulus varies from breed to breed for a given stressful situation, the pain threshold level differs too. A well bred German Shepherd Dog has comparatively high level of pain threshold than most other dog breeds. By saying this I mean to say that the capacity of tolerating pain has been genetically engineered into the breed. Hence “hardness” is not 100% psychological and physiologically trait in GSD and other dog breeds, although, as a matter fact the level of hardness also varies form dog to dog within the breed itself. GSD has higher “Hardness” trait, means they can tolerate tremendous stress with little negative attitude. That in turn means that the GSD needs to handle strongly and requires strong corrections when they are disobedient. Now what does it mean when I say that “Hardness” in GSD is a psychological trait, being physiologically based? From physiological view point, the hardness in GSD means that the dog is strong by nerve. It relates to the thick sheathing around the nerve fibers in the body of the dog which makes its pain threshold higher than other breeds. Sometimes the hardness is so high that corrections to disobedient behaviors sometimes become quite tough for les- experienced trainers. This is why an experienced specialized dog behaviorist/ trainer will always suggest not to hit him while training. This will make the training process harder and ineffective. Softness: Softness in the character traits in German Shepherds is just the opposite of the hardness. Wild dogs in the nature are comparatively softer than the pets. In fact the softness is a natural trait that helps the dog to save himself from natural dangers. Softness breeds a bit of fear in them which acts as the natural measure for protection themselves form real danger – as I said in my last post. Softness in German Shepherd Dogs is another psychological trait that is associated to the fear from stressful experience. Excessive softness is a behavioral fault in the GSD breed. This is because these dogs are bred to work under a wide range of stressful situations. If a German Shepherds fail to do that, it means it doesn’t satisfy the breed’s actual purpose. You will probably like to read about BREED EVOLUTION TEST IN GERMAN SHEPHERD DOG (Schutzhund) that has been designed to separate German shepherds with correct physical and character traits from the ones that have undesirable traits. Just as all breeds have their own respective characters German Shepherd Dog has its very unique character traits too. A German Shepherd lover would always describe the breed as royal, assertive, courageous, adaptable, intelligent and powerful and last but not the lest the most talked about dog breed in the world. Well, now it’s important to discus the character traits that have made German Shepherds the most popular of all dog breeds. Picking the right breed is of utmost importance for you if you are a first time owner. If you are in love with this breed, you need to know his character traits in advance so that you can handle him correctly as he grows. Since the character traits of the dog depend of more than factors, they are grouped under heads such as Purely Psychological traits, Psychological + Genetic traits, Psychological + Physiological traits and Purely Genetic traits. This post is all about the character traits in German Shepherd Dogs that are purely Psychological and Psychological, but genetically based. My next post will talk about the Psychological + Physiological traits, followed by a post on Purely Genetic Traits in GSD. Trainability: GSD, by nature, is one of the most intelligent dog breeds that can be easily trained to work on a wide range of projects. This is a multi purpose dog breed that have been trained for war, guarding, guiding blinds, as companion dogs, working in movies, working in police and detective departments, working in drug detection departments, working as PAT (Pro Dogs Active Therapy) and shepherd dogs to herd cattle. His inquisitive to learn things helps him learn new tricks in short span of time, and this is what helps the trainers to train him easily. Confidence: German Shepherd Dog, by nature, is highly confident. This psychological trait has been environmentally engineered into the breed. This is a by-product of the ability of the dog to bear more stress than many other dog breeds. German Shepherds have been bred to tolerate comparatively more stress than others. This means the break even level of bearing stress is higher than many other dog breeds. This makes the dog enhance his ability to struggle and win more stressful situations, which in turn makes him more confident as compared to many other dog breeds. Remember, as soon as he reaches the optimum stress point – that is the break even point he cannot accept more stress and in such situation he will normally respond back adversely due to lack of confidence like any other dog breed. Courage: Courage is a psychological trait that is defined as the absence of fear. German Shepherd Dogs are courageous, which means he doesn’t fear the danger. This trait can be viewed as a by-product of confidence trait. Courage this can also be viewed as one of the genetic traits, because this has been bred into the dogs by breeding out the fear, through selective breeding programs. Dogs in natural state are usually soft and not so courageous. Fear: Fear is both psychological and genetic trait. Rather more of the Psychological trait than genetic. Many well breed German Shepherd Dogs that have been bred to discard out fear have still shown fearful behavior. Fearlessness is a natural psychological trait in German Shepherd Dog, but Fear, on the other hand also acts as the natural measure for protection form real danger. Excessive fear in German Shepherd Dogs is a serious fault. Proper socializing to sounds, strangers, and different situations is a must to nurture the dog’s natural fearless trait, although in few cases socializing doesn’t help to regain or nurture the fearless trait in German Shepherd Dogs. This happens due to incorrect breeding when fearfulness becomes a genetic trait. Moodiness: Moodiness is also psychological trait, but also genetically inherited. Moodiness is a typical behavior, which should be viewed as the inclination or tendency for inconsistency in behavior. Moodiness leads the dog to work great one day and worst just the next day. This inconsistency does not imply that the dog is a worst working dog or suffering from under nutrition. Moodiness is just a psychological or sometimes genetic fault, which cannot be noticed until it reaches the extreme level. Viciousness: Viciousness is again another psychological trait, but genetically based. It is an inclination to outburst with an unwarranted vicious aggression which deviates from the GSD standard as a behavioral fault. Though noticed not too often, such aggression is observed under unpredictable situations. When exhibited, such behavior may be quite detrimental to the pack members and owners. Temperament: Temperament is a psychological trait, which can be significantly influenced by the environment, but at the same time can be observed as genetic trait too. Temperament is determined by three distinctive categories… full, moderate and poor. A GSD with full temperament will be full of zest and zeal, while moderate temperate means the dog has a moderate level of zesty attitude and a poor temperament is used to describe a sluggish dog that is lethargic. Stay tuned for the up coming post on Psychological + Physiological Character traits in German Shepherds.